In 2006, the International Standards Organization (ISO) released the first of two open standards for office applications with the purpose of having formats that were not locked into particular vendors. The goal is to allow businesses and individuals to easily switch office suites without loosing access to their documents or loosing data and formatting in those documents. These formats are zip-compressed and based on the Extensible Markup Language (XML). XML is a language that provides common syntax for exchanging documents from one application to another. This makes it an excellent basis for office formats. The two standards approved by the International Standards Organization are Office Open XML and OpenDocument Formats. This shows the Office Open XML Strict version in the Options dialog in LibreOffice. The Strict version can be set as the default file format. In 2006, Microsoft standardized a new format through the European Computer Manufacturer Association (ECMA). The formats were then sent to the Joint Technical Committee of the International Standards Organization (ISO). The standard is ISO/IEC 29500, which has been updated several times since being approved in 2008. The standard has a transitional form and a strict form. The transitional form has retained elements that make it backward compatible. Older versions of Office, starting with 2007, can open documents in this standard. However, the transitional is controversial because there are parts of the standard that are hidden, so a document does not always look the same when it is opened by third-party applications as it does in a Microsoft application and vis versa. Many times information is lost when a transitional document is opened in another application. All office suites that use the OOXML standard, either natively or as an optional format, use the transitional version. This includes Office. Microsoft’s suite saves in the transitional formats by default in versions 2010, 2013, 2016, and the Mac versions. Click the save button in one of the Office applications, and it will be saved in the transitional format, unless the default format is changed in the settings. The Strict version is supposed to be vendor neutral and fully open for anyone to read and implement. However, it has not been fully implemented in the latest versions of Office and most other office suites that can save or open OOXML formats. 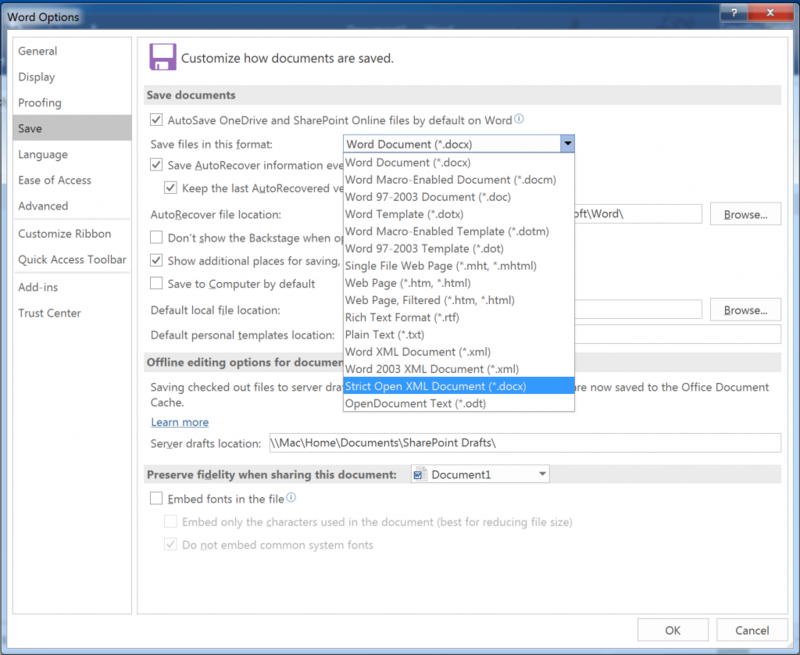 This shows the Office Open XML Strict version in the Options dialog in Word 2016. The Strict version can be set as the default file format. Office 2010 can read strict-conformed documents. Office 2013 and 2016 for Windows can create and read them. 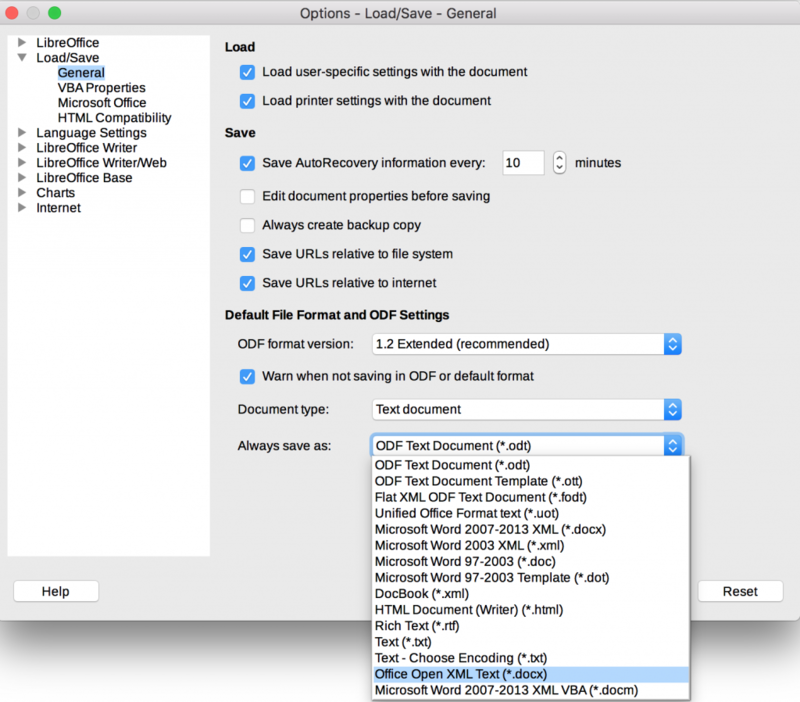 Office 2016 for Mac can read documents in this format. Both suites will not save in the strict formats when they are first installed. In Office applications, the format must be chosen from the Save As tab. In LibreOffice, it must be selected from the drop-down menu after choosing Save or Save As. However, Office 2016 for Windows and LibreOffice allow you to change the settings to save documents in the strict formats by default. The current ODF is based on the original formats created by the OpenOffice.org community, which was launched in 2000. Several years later the Organization for the Advancement of Structured Information Standards (OASIS), a non-profit consortium, decided to develop a set of formats based on OpenOffice’s standards. This is the what lead to the current ODF standards. OpenOffice adopted these new formats as its native ones, and LibreOffice as well as other applications based on the OpenOffice source code have also adopted them. Most other office suites, including the latest versions of Microsoft Office, can save and open documents in these formats. The group of applications from the Redmond, Washington corporation do not implement the formats like LibreOffice does, however. This Microsoft Web page lists what features the applications support, partially support, or do not support. Office 2007-2016 for Windows support the formats. However, only the latest Mac version – 2016 – will support them. Open standards advocates and archivists prefer OpenDocument Format to Office Open XML because it is more open than the transitional version of it and more widely used than the strict version. ODF standards are the most widely adopted office-suite formats that are fully compliant with the ISO. This not only frees documents from one particular vendor, but it also helps them be preserved for a long time, so data rot doesn’t occur. The designers of LibreOffice are open standards advocates, and the open-source suite has been designed to be fully integrated with those standards. This gives it some advantages over Microsoft Office. One of LibreOffice’s advantages over Microsoft Office and many other office suites is that it acts like a master key. The engineers have designed it to open many modern document formats and several legacy ones. Therefore it can open most office documents, and they can be saved in OpenDocument Formats. These formats have clear advantages over the OOXML formats. They can be more completely supported by other applications, such as Google Docs. Since they are completely open, they are also the best format for preserving documents for a long time. This makes LibreOffice an excellent tool to preserve documents fo a long time. It can easily be used alongside Microsoft Office. You can easily install it on your hard drive by downloading it. It also can be run from a USB drive or other type of external media with the portable version.